For many audio purists, nothing compares to the brilliant moment when a stylus first settles into a groove. And thanks to the current record renaissance, not only are there a bevy of classics available from your local record store, but there is also an increasing number of new artists releasing their latest albums on vinyl, usually alongside a digital download code to give you the best of both worlds — class and convenience. If you’ve been squirreling away cash to get in the vinyl game, there are now a ton of options that cater to both your audiophile cravings and your aesthetic sensibilities. Contrary to what your nerdy audiophile friends may tell you, you don’t have to spend a mint to enjoy the great sounds of analog. 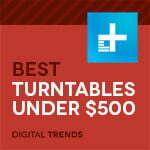 We’ve compiled a list of the best turntables available under $500 that will bring music to your ears. Whether you’re building a collection for the first time or are a seasoned listener re-establishing your analog habits, make sure you know how to properly set up a turntable, and be sure you know how to clean your vinyl. Otherwise, you might not be getting the most out of your investment. If you’re really serious about your tunes, we also suggest you learn a bit about acoustic treatment, too. After all, your speakers and turntable are only as good as the room you put them in. Note: Some of these turntables include a built-in phono preamp, while others do not. A phono preamp is a device that boosts the signal from the turntable so that modern electronics can play it. While many older receivers have a phono input, some newer devices do not. Whether or not you need a preamp will depend on your receiver/amplifier and favorite speaker setup. Why you should buy this: Simple functionality, classic looks, and USB connectivity. Simple and classic, the Audio Technica AT-LP120 has long been the best turntable for new vinyl listeners. Who it’s for: The new vinyl enthusiast who wants an affordable and great-sounding turntable that will last for years. How much it will cost: $230 to $300. It’s hard to argue with a classic. This hunk of sparkling chrome might not be as fashionable as the others on our list, but it still looks and sounds good, and at a very enticing price. Though it sports a direct-drive motor as opposed to the belt-driven system some audiophiles prefer at this price point, the Audio Technica AT-LP120 is a go-to starter turntable that’s rugged and reliable. It also hosts plenty of features like a selectable internal preamp so you won’t need a phono input, a USB output to capture your vinyl in digital form, and three speeds to handle virtually anything in your collection. Whenever people ask us what the best first-purchase turntable is — and they ask us a lot — we always point them to the LP120. Why you should buy this: A carbon fiber tonearm, Ortofon 2M red cartridge, and hefty platter. With a carbon fiber tonearm and Ortofon 2M Red cartridge, the Pro-Ject debut carbon is among the best-sounding tables under $500. Who it’s for: The aspiring audiophile who hasn’t quite landed a corner office, but demands the highest-quality components for the money. Designed to set new standards in the affordable audiophile category, this belt-driven table boasts a carbon-tube tonearm to reduce unwanted resonance, a quiet-run DC power supply, a weightier platter to hold your records more securely, and an Ortofon 2M Red cartridge to help you rock out to optimal sound. One caveat — there’s no dust cover on board, so you’ll have to clean those records diligently to keep your stylus sterling (we recommend the tried-and-true LP brush from Audioquest). Not only does this table sound amazing, it also looks fantastic; we can actually feel you picturing this beauty in your listening room, trying to decide if you should go with a flashy color from its seven available choices, or perhaps something more restrained. Luckily, with a table this cool, there’s no wrong answer. If you’re looking for the best sound for the money, there is absolutely no better buy. Why you should buy this: Simple functionality, and long-term upgrade potential. With solid construction and a direct-drive platter, the Stanton T62 is the best budget turntable you can buy. Who it’s for: The new vinyl listener who wants a well-constructed table to launch into their new hobby. How much it will cost: $160. Where many entry-level tables boast more features than the Stanton T62, they lack the overall quality of this beginner deck, which offers a stable direct-drive motor and a well-constructed tonearm with replaceable cartridge. Because it was designed with DJs in mind, the T62 is an extremely rugged turntable that should last for years, and the replaceable cartridge means that buyers can eventually upgrade their sound with a fresh purchase from Audio Technica or Ortofon. The T62 is also easy to use, with a large play/pause button and speed adjustment mechanisms. The simple black color with blue highlights doesn’t make this the flashiest model in the entry-level price bracket, but it should complement your hi-fi just fine. If you need the best turntable for the lowest dollar amount, look no further. Why you should buy this: Great sound and gorgeous design in multiple bright color options. A beautiful acrylic platter and eye-catching color options make the U-Turn Orbit Plus the best-looking turntable on our list. Who it’s for: The style-conscious vinyl enthusiast who wants great looks as well as superb sound. How much it will cost: $290 to $310. U-Turn’s Orbit Plus is among the best-sounding and most beautiful turntables you can buy under $500, and that’s largely because of its simplicity. There’s no built-in preamp, no USB connection, and no automatic function. There’s also no cue lever, so users will have to manually set the needle, as well as manually adjust the belt to switch between 33 and 45 RPM speed settings. All of this may be daunting for newcomers, but those who can accept that will find a sturdy turntable that runs quietly and sounds great, with elegant design cues like the above-board belt that allows you to watch the motor spin your favorite discs. Also, the lack of options lets U-Turn focus on quality. The Plus comes with an excellent Grado Black cartridge, and the high-mass acrylic platter will keep your vinyl spinning smoothly, making for a beautiful long-term investment that will shine for years to come in your listening space. Why you should but this: An exceptional onboard digital-to-analog converter and USB connectivity. With an excellent onboard digital-to-analog converter, the Sony PS-HX500 allows you to digitally preserve your vinyl at ultra-high quality. Who it’s for: The audiophile who wants to preserve rare records at the highest-quality digital resolution. How much it will cost: $330 to $400. Those with the rarest stacks of wax will love the Sony PS-HX500 for its preservation abilities. Though it has the chops to play back your favorite records with brilliant clarity and warmth, it’s specifically designed for those who want to digitize their rarest analog music in high resolution. Paired with a special high-fidelity recording app, the player utilizes a quality Texas Instruments analog-to-digital converter that transfers at a bare minimum of 16-bit, 44.1kHz CD-quality resolution. From there, the sky is virtually the limit in terms of conversion: Sony’s deck can transfer files up to 24bit/192khz and even 5.6MHz DSD — the highest quality of any USB turntable of its kind. The price is on the high side, but if you want to preserve your vinyl for the virtual age without fancy outboard gear, this turntable is the way to go. We test turntables both at home and in our A/V testing lab over a period of weeks, using a wide variety of music both new and old. Typically, each turntable is connected to a wide variety of high-end speakers and our favorite stereo amplifiers, and compared side by side with other options in the price range when possible. We also test each turntable with both its inboard (where applicable) and outboard phono preamp, allowing us to hear the sound of the turntable via both inboard and outboard gear.